It’s time for me to write about how Lincoln Xavier Gehring came into the world. Starting at about 5:00pm on Tuesday, Amber and I got the car packed… made sure we had everything, and headed to Applebee’s for our “last meal”. We got a good amount of food in our tummy’s, and talked about the upcoming experience we were about to have. For the most part, we were prepared for everything that could happen. 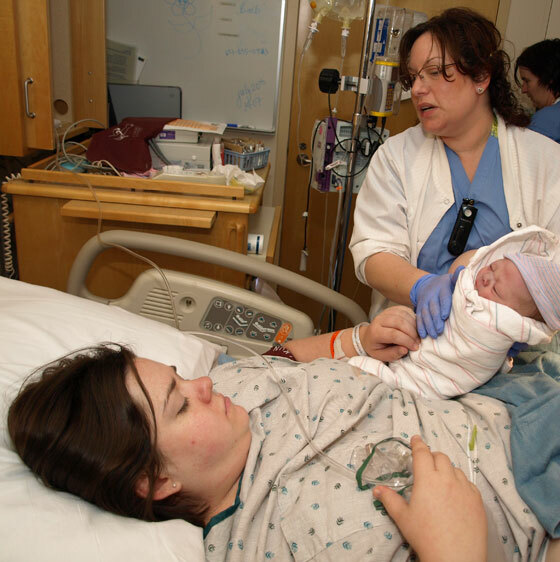 Classes we had taken in May had told us about everything involved with induction as well as most of the complications that could happen during labor. They left out a few details here and there, but again, for the most part, we knew what was about to happen. We arrived at the hospital at about 6:00pm and got checked into our private room. We met Kirsten (or was it Kristen), the first of our many nurses. She was great, and explained the process that we would be starting that night. She also was the one who got us all “banded” up. The first night there was a little rough. Amber was on monitors so every time she would have to wake up to go to the restroom, I would have to wake up as well to help get her out of all the monitor equipment. It was fun to listen to the babies heart beat though as the evening went on. In the morning, the induction began. By about 10:00AM we knew it was working, and the pain management drugs had been called for. It wasn’t long until we started counting centimeters to 10. The nurse was amazed by how quickly it went, and at 1:00 o’clock, we were ready to call the doctor, and start pushing. When the Dr. was called, he was on his way to lunch. He had to turn around and make his way back to the hospital without eating… When he arrive, he got setup and said, I’m going to run down the cafeteria and grab something real quick. Both him and the nurse thought it still might be an hour or two before the child would make his way into the world… However, thank to Amber’s amazing pushing skills, when the doctor got back 15 minutes later, he said “We are a turkey burger away from being done…”, meaning we were past half way because that was what he had for lunch :-). Amber was amazing at her pushing skills, and it was probably the speed at which Amber pushed at the final stages that the doctor’s said probably saved his life. As we reached the final push, and Link began to emerge, it was hard to take in what all was happening with both Amber and the baby. Our amazing doctor made this quick hand movement while taking him out that until he said “wow, this kid has the cord wrapped twice”, I didn’t realize what he had done. He had already unwrapped the first wrap before even getting him fully out of Amber, and very quickly had removed the second wrap as well. I then cut the cord, and the laid him on his mothers tummy, something they do at Woodwinds to let the mother meet her baby right away. Immediately though the scene changed energy and pace. First the doctor leaned over and started suctioning his noise. He said “I need to get more suction on this kid”, which at first meant he was going to use the noise suction thing some more to clean his nostrils out, however, I very quickly realized that he was talking to the nurses to ready the baby’s care station with the proper gear. Almost immediately the grabbed the kid and brought him over to the “baby station”. At this point, I realized he wasn’t quite breathing… something I had been told happens quite a bit, but to be honest, wasn’t quite prepared for it. They very quickly started to perform some massages that I swear I must have seen on ER, Grey’s Anatomy, or in some movie a half dozen times… so in my head, I knew how it was supposed to go… At around 30 seconds he would start to breathe and cry and the drama would be over. However, what happened next I was not prepared for. Instead of him crying, the nurse paged another nurse. About 10 second later, she got a reply that the person was not available. Then the nurse says to me (or the room, I’m not really sure), “can you hit the nurse button please”. I immediately scramble trying to figure out where the nearest nurse button was. Just as I figured it out, our Dr., who had start working on Amber again (for those of you labor newbies, labor isn’t over after the birth of the child) hit it and the nursing station asked “Nursing, what can I do for you” or something like that. Our wonderful nurse shouted across the room. “I need the NNP right now”. I didn’t know at the time what NNP was, but I was sure it was another doctor or nurse who was better for the situation that was developing. I later learned it stood for “Neonatal Nurse Practitioner”. She was the person they called when the baby was in more serious trouble. This whole time, my eyes are for the most part fixated on our child, occasionally looking at Amber’s very blank face. He was starting to become extremely purple, and I felt… helpless. About 10 second later, the NNP walked in. While all this was happening, another nurse, Jennifer, had unpacked a breathing apparatus (“a bag”), and they immediately started to pump air into him. I had kind of lost track of time, and so my 10 second messages here may be a little off, but time was immediately what became the issue in the room. 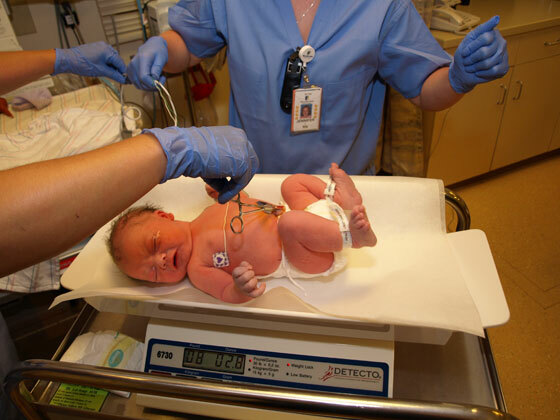 The NNP wanted to know what time the kid was born (2:07pm) and when she looked at the clock on the wall, it was already 2:12pm, which had her thinking that we had hit a very very bad point (the 5 minute mark). They got that cleared up fairly quickly by realizing they didn’t use the clock on the wall to determine time of birth. Someone mentioned that they may need to get St. John’s on the line fairly quickly, but I think they decided against that once the time was sorted out (not sure to be honest, some of it is still a bit of a blur). After about a minute, they said we’re going to take him over to meet mom again now, so get your camera ready. I ran over, and very quickly snapped 2 photos of the nurse showing our cleaned up son to Amber. You can see on the whiteboard in the background the time of birth that was written down right when he was born as well. First it was “Let’s get him on 100% O2” and what’s his glucose. A few minutes later, they reduce him to 80% 02 and “let’s get that xray up here”. Then there was some laughter about his glucose level being something like 176, which was about as low as it can get (I guess, when I did further research, I’m guessing that was 17.6 based on this article, or 1.76 based on this one). They gave him some glucose, then dropped the 02 to 60%… Soon they had him on room air, and all that was left was the xray. At this point I started asking all sorts of questions about where things were at, and they filled me in, letting me know that they believe he would now be just fine, but they would watch him for the next 4 hours and get an x-ray before deciding if he needed to be “Admitted”. They told me though that I could start spending time with him though, and that I could start to bring back friends and family one by one. This is also when they weighed him in :-). I got out and talked with the family and Amber for a little bit to make sure Amber was alright (I hadn’t left the room for a good 30+ minutes at that point). Gave everyone their turn to see him, and eventually brought Amber back to meet Link. It wasn’t long after this that he was in our room, and our first night with him began. There are more stories to share from the hospital, but I’m pretty sure I will always remember this moment as the moment I became a dad. Really enjoyed reading this, Justin! Mykala and I are very very happy for all 3 of you! Also, it's sort of surreal for someone I've known so long to be a father — I can only imagine how amazing it is on your end! Justin, you are a wonderful, wonderful Daddy! Amber is such a fantastic Mommy! I can't read your post without crying. It was so scary, how Link came into the world. Thankfully, he is a perfectly healthy boy, with no lasting effects at all from his birth experience. Just a very loved and well cared for little baby boy!